Lost property presents a large problem for us because so many articles of clothing in particular, do not have your child’s name on the article. Please name each and every article of our child’s clothing with their first and surname please. 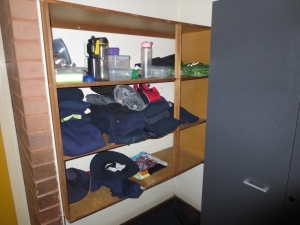 All items of lost property are placed on the shelves in the alcove just outside the Computer Room in Cluster A. All items will remain there for 2 weeks only. Unclaimed items of clothing are then given to the uniform shop for the secondhand uniform stock, or given to the Salvation army if the items are not uniform. Lunch boxes and drink containers will be disposed of.